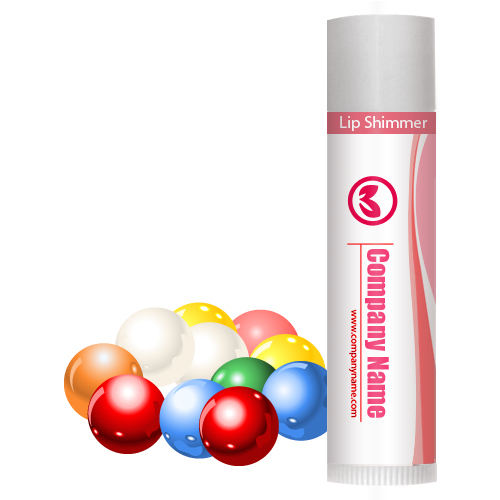 Personalized bubble gum lip shimmer w /white tube cap is lip smacking and provides a cherishing finish to your dry or impaired lips. This lip balm gently soothes lip tissues, repairs impaired skin, enhances texture of lips and leaves you numb with its bubble gum flavor. This candy tasting delicious lip balm is hot favorite of Americans, who rarely forget their childhood tastes. Health Quotient – Animal Cruelty- free. Formulated using beeswax, vitamin E, coconut oil, light mineral oil, aloe oil, and various other natural, semi-synthetic and synthetic skin conditioning substances. No PABA. Bubble gum flavor. Harsh product manipulators avoided. Directions – Apply bubble gum lip shimmer along with your make up or over bare lips. Apply it regularly to gain desired effects. Avoid rubbing it over eyes or other parts of face as a moisturizer or skin toner. Gifting Favors – Personalized bubble gum lip shimmer w/white tube cap can be considered for business gifting by marketers targeting kids or young minds. It can be directly offered to them during shopping or individually as a greeting token during some promotional events.